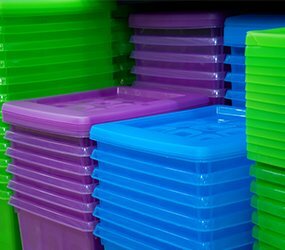 We’ve talked a lot recently about the benefits of plastics as a whole, but like lots of materials it comes in many types – each with their own distinct advantages and disadvantages. Here, we look at some of the most common plastics, and the pivotal roles they play in our daily lives. Polypropylene (or PP, to use its snappier title), is strong yet flexible, able to withstand temperatures of up to 200°C. At temperatures beyond these it softens, making it easily mouldable and therefore very easy to process. From a consumer point of view, the finished product is durable for its size, known for its high tensile strength and resistance to corrosion, chemicals and moisture. This makes it ideal for the manufacture of smaller items like ice cream or butter tubs, straws, kettles and garden furniture. Prescription bottles are another set of items that benefit from the use of PP in their construction, as it helps keep a solid barrier in front of their potentially dangerous contents without using more expensive or brittle materials (such as glass). As the second most widely used plastic in the world, PVC accordingly sees use as a crucial construction material in thousands of items in hundreds of industries. Unlike PP, its high chlorine content makes it resistant to heat and outright fires. The famed durability of rigid PVC – especially to environmental factors like rain – combines with its non-corrosiveness and affordable cost, making it particularly useful for both household plumbing and industrial piping. However, softer foam PVC is a crucial component of car parts and thermal insulation. Other common uses for it include toys, shower curtains, squeeze bottles (such as fairy liquid) and detergents. Unequivocally the most widely used family of plastics in the world, polyethylene’s simple basic chemical structure makes it easy to manipulate and process (which we prefer to do with our roto-moulding technique). Low-density polyethylene is especially soft and flexible, making it ideal for use in products like rubbish bags, disposable gloves, juice bottles and bleach containers. On the other hand, high-density polyethylene’s chemical makeup is dense and crystalline, which gives it its trademark stiffness, strength, toughness and resistance to moisture. Today, it’s frequently used in many products (including our own safety steps and grit bins) but its introduction into the world was a little more improbable than that – the first widely marketed product to use PVC was in fact…the Hula Hoop! Of course, this is just a sample of the many types of plastic that we use on a daily basis. Others include polystyrene, a well-known impact-resistant plastic that’s used as a packing material, and Teflon – a plastic that provides a frictionless and heat-resistant surface, making it especially well-suited to pots and pans and other cookware, as well as waterproof coatings and films. You can read more about how we create our plastic products by looking at our roto-moulding process, or just click here to find out how your business could benefit from our contract rotational moulding services.